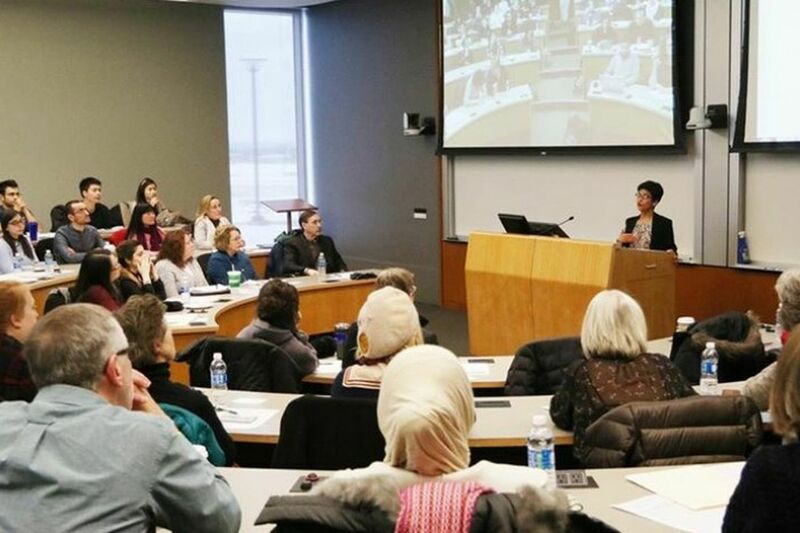 Shoba Sivaprasad Wadhia, director of Penn State University's Center for Immigrants’ Rights Clinic, speaks at an information session on the travel ban imposed on seven Muslim-majority countries since 2017. Seven days after his inauguration, President Donald Trump signed a controversial executive order aimed at blocking immigration for nationals from seven Muslim-majority countries: Iran, Iraq, Libya, Somalia, Sudan, Syria, and Yemen. Commonly known as the “travel ban" or “Muslim ban,” the policy went into effect immediately and caused chaos at airports around the country, including Pennsylvania. Two years later, and despite successful decisions by the lower courts to block the ban, little has changed. A rebranded version was implemented fully on Dec. 4, 2017, because of a decision by the Supreme Court to execute the ban before making a final decision. On June 26, 2018, the court gave its verdict in Hawaii v. Trump and by a vote of 5-4 upheld the ban as lawful under the U.S. Constitution and immigration statutes. Sen. Bob Casey of Pennsylvania said the ruling “will remembered as a shameful moment in our nation’s history." Today, the ruling is still blocking people from the United States and separating them from their loved ones. Currently, the ban applies to all “immigrants” and some visitors from Yemen, Iran, Syria, Somalia, Libya, and North Korea. It also applies to certain visitors from Venezuela. Immigrants refers to people seeking admission to the U.S. for permanent reasons, like a family relationship or for a job with a U.S. employer. By contrast, visitors or “nonimmigrants” refers to people seeking admission to the U.S. for temporary reasons, like education at a university, visitation with family, or a business meeting. Congress wrote the immigration statute in 1952 and created what remains the primary framework for immigration law. The statute lists the categories under which a person may enter temporarily or permanently. Importantly, Congress removed the national origin quotas from the immigration statute in 1965. And yet, the ban blocks people who are legally eligible to receive a visa from obtaining one and for no other reason than where they are from. The human impact of the ban has been profound across the U.S. and in Pennsylvania. U.S. citizens married to a spouse from a banned country have been separated for months and even years. Similarly, students admitted into top-rate programs at universities are prevented from studying in their field because of the ban. And parents or grandparents who wish to come to the U.S. to watch their daughters and sons graduate from college or visit their grandchildren for the first time have been unable to do so. Directing an immigration clinic at Pennsylvania State University, I have personally witnessed the impact of the ban on individuals, families, and institutions. At the clinic, law students work on a range of immigration work: community outreach, legal support in individual cases, and policy work on behalf of institutional clients. As of February 2017, among all U.S. universities, Penn State had the fourth highest number of students with visas affected by the first ban. More recent data from the Department of State, analyzed by the Migration Policy Institute, shows just how significantly immigration has dropped for nationals from countries covered by the ban. According to its analysis, between fiscal year 2017 and 2018, immigrant visa issuances were down by an average of 72 percent for nationals of Iran, Libya, Somalia, Syria, and Yemen. There is a case-by-case waiver process for those who can show hardship and other requirements, but it remains elusive for many and has failed to keep families together. One resource developed by the immigration clinic and partnering organizations chronicles the stories of people denied a waiver. The Supreme Court’s ruling in Hawaii v. Trump set a dangerous precedent of throwing a sledgehammer at our immigration statute — and at the inclusive values underpinning that statute. Congress should seriously consider legislative fixes to limit the scope of future bans. Meanwhile, those covered by the ban should work with an immigration attorney to determine if an exemption or waiver applies. We all need to spread accurate and updated information about the ban and learn more about how people are affected — because they are affected, every day. Shoba Sivaprasad Wadhia is the founding director of the Center for Immigrants’ Rights Clinic at Penn State Law in State College. She is the author of “Beyond Deportation: The Role of Prosecutorial Discretion in Immigration Cases” and “Banned,” forthcoming this year. The views of the author are in her own capacity and not on behalf of Penn State.